In the late '30's when I was in college, physics, and in particular nuclear physics, was the most exciting field in the world. It seemed as if every major experiment brought a Nobel Prize. Eve Curie had just published the biography of her mother, Madame Marie Curie, which should be a must on the reading list of every young aspiring female scientist. 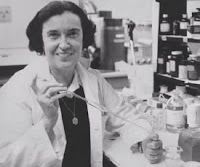 While earning her Ph.D. at the University of Illinois, she married; as Dr. Rosalyn Yalow (above left), she would become the 2d woman to win a Nobel Prize in Medicine, for her work developing radioimmunoassay, which "invigorated the field of endrocrinology, making possible major advances in diabetes research and in diagnosing and treating hormonal problems related to growth, thyroid function and fertility." (credit for 1977 U.S. Information Agency photo) Yalow died in the Bronx on May 30 of this year.